Musgrave was named to the crew of STS-80 on 17 January 1996. The sixteen-day science mission was to deploy and retrieve a pair of science satellites - the ORFEUS-SPAS astronomy satellite and the Wake Shield Facility (making its third flight to grow thin film semiconductor material in the near-perfect vacuum in orbit). There were also two planned EVAs, designed to refine techniques that would be employed on the ISS during its construction. Musgrave was assigned as MS 3 and rode on the flight deck (Seat 3) during ascent. He was supposed to swap with Tammy Jernigan for the ride home and sit on the mid-deck Seat 5, though this did not happen. For the first time Musgrave was not part of the EVA crew, but used his experiences as IV crew member for the planned EVA. His primary crew responsibilities were for the Wake Shield Facility and for Earth observations. Back in the ''deeper pool''. 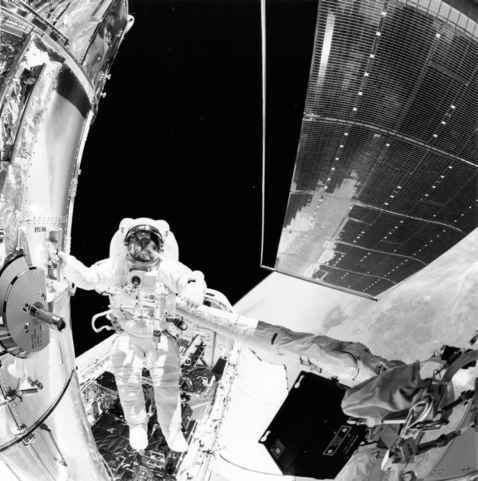 STS-61 astronaut Story Musgrave, with helmet visor raised, holds onto one of the handrails on Hubble during one of the mission's five EVAs, more than ten years after he participated in the first Shuttle EVA from STS-6. supported preparations for the EVA, giving a video downlink explaining the EVA mobility unit components and operations, before the two scheduled EVAs were cancelled due to a jammed hatch door latch. Despite the cancelled EVA, the crew's disappointment was alleviated somewhat by being given an extra day in orbit to conduct science and observe the Earth. Bad weather also played its part in making STS-80 the longest space flight of the Shuttle to date. 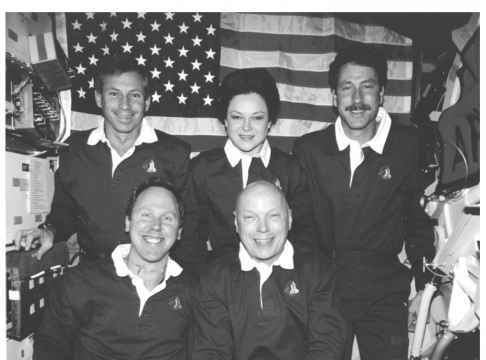 The crew of STS-80. At rear, left to right: Commander Ken Cockerel, MS Tamara Jernigan, Pilot Kent Rominger. At front: MS Tom Jones and Story Musgrave, veteran of six Shuttle missions and the only astronaut to have flown into orbit on all five orbiters. designing the mechanisms that opened the EVA hatch. Once the airlock was re-pressurised and opened into the mid-deck, Musgrave went inside to see if he could determine what was wrong. He knew the design of the mechanism could not fail on its own and as he touched the handle it was obvious that it was jammed against something in the gears, which were not accessible to the crew. Post-flight inspections revealed that a screw had indeed jammed in the gear mechanism. It was replaced and the hatch opened perfectly. Habitability on his last flight was better than before, as there were fewer crew members (five), no shift system, no extensive EVAs planned and few mid-deck experiments to crowd up the area. It was a lot more comfortable than on his other missions, especially compared to STS-61. During descent, having no major responsibilities for entry and landing and riding on the flight deck instead of the mid-deck as scheduled, Musgrave again took the opportunity to stand up, becoming the first person to witness the plasma and the fire at entry interface through the overhead windows all the way down to Mach 10. 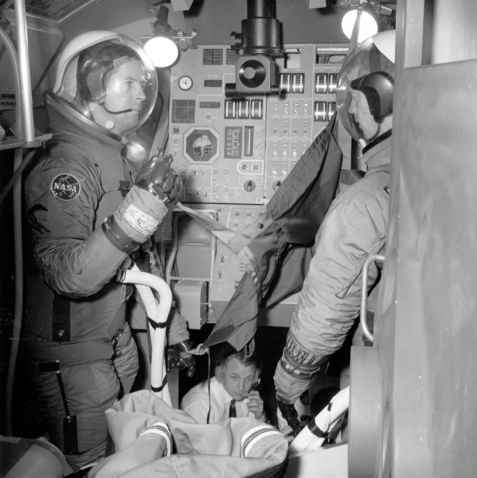 Holding onto the shoulder of Tom Jones in the centre seat (MS 2), he was able to observe and take extensive video footage of the phenomena all the way down. "You can't believe you don't evaporate in a flash with that amount of plasma. I call it fire. Technically, it's plasma, but to the naked eye, it's fire. ''26 The plasma shock wave and high Mach aerodynamics were captured on film as Columbia cut through the upper atmosphere. The experiment was not an official one, but one which Musgrave wanted to record from an engineering perspective and, as a scientist-astronaut, from a humanities angle. There was no operational requirement for the event to be filmed, but Musgrave went ahead and did it anyway. 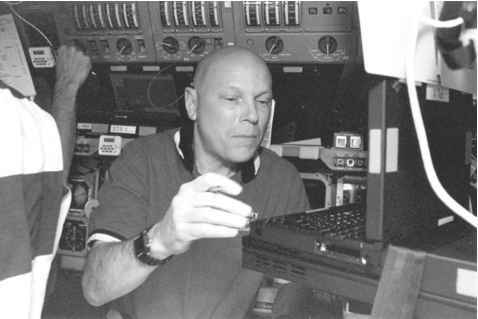 Musgrave works with a pair of computers dedicated to the Wake Shield Facility operations on the aft flight deck of Columbia during STS-80. will probably not be surpassed by any other Shuttle mission. Musgrave extended his Shuttle duration record and, at sixty-two, became the oldest man to fly into space (until 1998 when former senator John Glenn, at the age of seventy-seven, returned to orbit as a crew member of STS-95 some thirty-six years after his pioneering Mercury orbital mission in 1962).